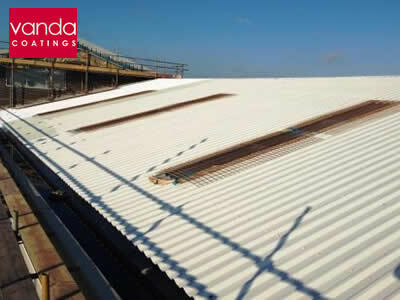 As can be seen by our time lapse video our team at Vanda Coatings are experienced at industrial roof spraying. The section shown through time lapse photography covered an area of approximately 200 square metres, though the total roof area that was re-coated was much larger. With any re-spraying project it is normally the preparation that is the most time consuming. When it came to industrial roof spraying in Rochester, much of the prep on this office building had already been done by the client before the Vanda team arrived. Because the roof had been pressure washed the first thing John and his team had to do was to mask off the skylights which were covered in steel mesh. Working at height is not always easy and our teams have IPAF and PASMA certificates to ensure they have the health and safety skills to use powered access and towers respectively. The next stage was for two people to prime the industrial roof, but it had to be dried off before priming. This meant mopping the roof to remove most of the moisture and the team found that by the time the sun came up it was dry enough to prime. The first layer to go on to the roof was a noxyde primer using an airless and the section shown in the video took about three or four hours to prime. The roof was left to dry till the next day and then the same process of mopping and drying was repeated before the top coat of paint was applied. The surface was 800 metres squared in total and it took a week for all of this industrial roof spraying work to be completed.